Perched like a technicolour peacock on the sofa of a suite at the Landmark Mandarin Oriental, Iris, whose long flight to Hong Kong has induced a bad bout of sciatica, is excited about her first visit to Asia. “It took me 95 years and 30 hours to get here,” she quips, ever ebullient. She’s wearing vintage red satin Salvatore Ferragamo slippers, a multicoloured patchwork jacket she picked up in Afghanistan, and what she wryly describes as her “itty bitty mini beads,” vast metal spheres jangling about her neck. Simply being in Iris’s presence is fun. Today’s ensemble is just one of the thousands of idiosyncratic get-ups for which the slightly built nonagenarian is revered. A bona fide fashion luminary and avid collector, Iris has spent a lifetime amassing a vast and enviable collection of costume jewellery and clothing from all over the world—so vast, in fact, that she requires multiple apartments and warehouses to store it all and has donated hoards for auctions and to museums. Her uniquely fabulous “more is more” approach to dressing sits in refreshing contrast to the mantras of minimalism largely propounded by the style set. Extraordinary vintage and couture finds are paired with tribal clothing and thrift-store bargains, then piled with enough costume jewellery to sink a small ship, creating outfits better described as art than apparel. The cherry on top of each sartorial smorgasbord is, of course, always a pair of Iris’s signature black oversized spectacles. 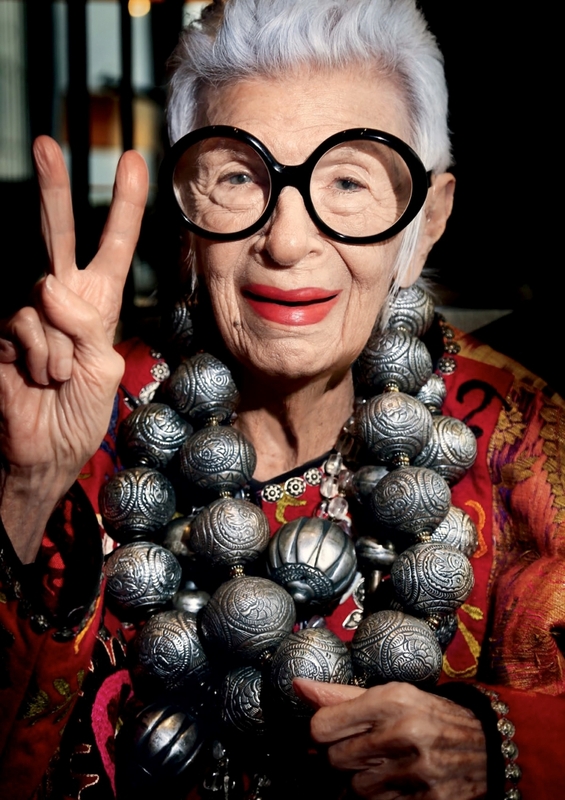 And yet, despite nowadays being one of the world’s most famous—and thanks to said specs, instantly recognisable—fashion influencers, until well into her 80s Iris was an unknown. It was not until September 2005 when the Costume Institute at the Metropolitan Museum of Art in New York dedicated an exhibition to her collection, that she came to wide attention. Entitled Rara Avis [Rare Bird], the exhibition catapulted her into the public limelight and the fashion industry’s consciousness. A flurry of press and attention followed the smash-hit show. Who is the owner of this mad and magical collection, people wondered? 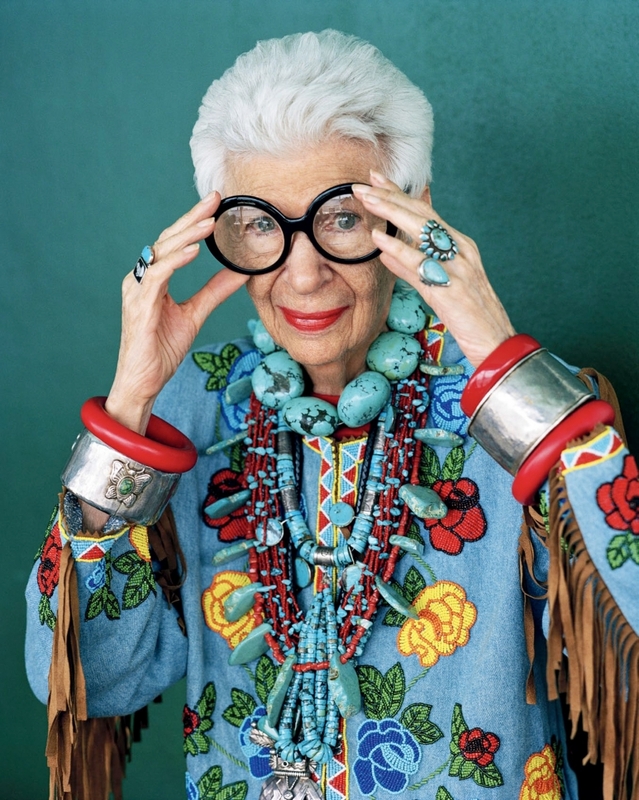 “Nothing I ever did I expected to do,” says Iris in one of the opening scenes of Albert Maysles’ 2014 biopic Iris. “It just kind of happened.” An Art History graduate of New York University, Iris worked for Women’s Wear Daily and for interior designer Elinor Johnson before setting up on her own as an interior designer. In 1948, she married Carl Apfel (“He was cool, he was cuddly, and he cooked Chinese, so I couldn’t do any better,” she remembers in the film), and two years later the couple founded Old World Weavers, a company specialising in the recreation of fabrics from the 17th, 18th, and 19th centuries. In search of aesthetic inspiration for her cloth designs, she and Carl, who died in 2015 at the age of 100, travelled the world—from the souks and bazaars of North Africa and the Middle East to the flea markets of Europe. 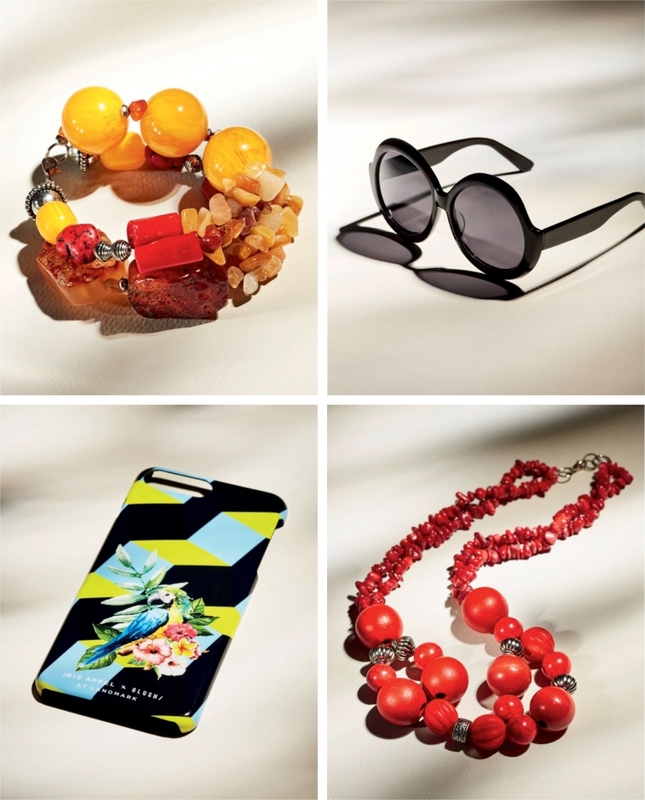 Those who would like to attempt a shortcut, however, can purchase a dash of Apfel’s panache via the range of accessories and ready-to-wear, Rara Avis, she launched on the Home Shopping Network in 2011 and still sells today. She also launched a clothing line with Macy’s in 2016 and was in Hong Kong to launch an Iris-inspired range of accessories in partnership with Landmark—from bangles to necklaces and of course pairs of Iris-inspired specs. During her time in Hong Kong, Iris charmed audiences at two special panel discussions. The fi rst was a public forum held in the Landmark atrium, with chair Divia Harilela and panellists Michelle Ong, co-founder of Carnet jewellery, and fashion designer Masha Ma. The panel discussed with Iris their views on originality, attitude and expressions of style, and fi nding fulfilment through creativity. The second was a private forum held in association with the Fashion Farm Foundation. Speaking to a group of the city’s young, up-andcoming fashion designers, Iris passed on her words of wisdom, charting a road to self-discovery through style. “I always enjoy working with the young designers and I hope I can help them in some way,” says Iris. While in town she also made sure to stop off at a few of the city’s most interesting markets and shops—from checking out jade and antiques on Cat Street to trying on specs at the Landmark. “Hong Kong is busy, bustling, and it’s very exciting,” says Iris. In addition to lending her aesthetic eye to design, Iris has also been in demand in front of the camera. She’s modelled for New York fashion house Kate Spade, accessories designer Alexis Bittar, and cosmetics behemoth Mac. She graced the November 2012 cover of Dazed and Confused magazine wearing a Tweety Pie-esque Rei Kawakubo creation at the age of 91. It seems everyone wants a slice of her enviable brand of nonconformity. Iris stands for fearlessness and fun in equal measure, a compelling combination. Her colourful and enthusiastic approach to living and dressing, coupled with her acerbic wit and vitality, make her an understandably lovable and inspirational public fi gure. In the documentary, one of her staff members reveals that her phone will ring “sometimes 50 times a day” with requests for interviews, modelling and collaborations. But does the “geriatric starlet,” as she refers to herself, enjoy all the attention?